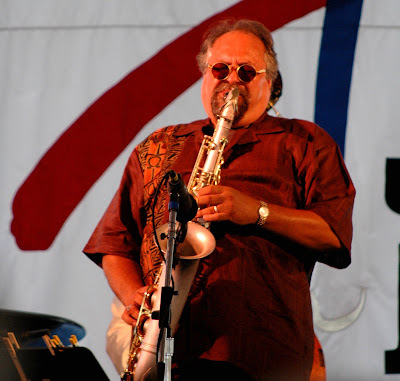 Saxophonist Joe Lovano presented an energetic and lyrical night of music, drawing heavily from the jazz tradition but with a constant focus on the freedom of improvisation and his own unique sound and history on the instrument. The material the band presented flowed seamlessly from tune to tune (Lovano hardly spoke on the mic – each set was a solid block of music), without a single count-in, and the musicians enjoyed defying traditional structure by varying the texture of the music, dropping out to allow solos, duos or trios to explore different sounds. It was in these situations that the accomplished Peter Slavov showed what a bass can do. Lovano opened his composition Weather Man solo, every phrase expressed with passion and intent, exuding great energy for the band to utilise when they joined him. There were plenty of surprises; the piece developed from noisy quartet rubato into a sensitive and thoughtful solo piano improvisation by Lawrence Fields, before charging into a blues where Lovano gave a fresh approach to the context, using his unique, liberal phrasing to cut up the form. The switch out of time and back to free for the final melody was incredibly natural. The band played very much as one unit, always listening, always enjoying the music. When not playing, Lovano would stand behind the drumkit, swaying and occasionally cheering, if not creating a new layer of texture with the shakers and bells he had beside him. The passion and love of the music came across strongly the entire time, Lovano exploring the extreme registers of the instrument with a powerful and personal tone. Exciting conversational interplay between the sax and the drums (played by the powerfully imaginative Otis Brown III) was enthralling in Dizzy Gillespie’s I Waited For You. Although played as a ballad on Lovano’s album I’m All For You, Otis Brown surprised the room with a cool afro-cuban groove, and rather than settle into a lush, sleepy love song, the band played rhythmically, often varying the feel and always with reference to the composed melody. These re-imaginings of what a jazz audience might usually expect brought a sense of natural improvisation and excitement to the entire selection of music. All evening the band joyfully manipulated the melodies of the tunes, slipping in and out of rubato, out-of-time playing and groovy swing playing. Lovano's sound was huge; he proved himself a master of the tenor and the music, and the band were right there with him all the time.